New network vulnerabilities appear constantly and the ability for IT security professionals to handle new flaws, fix misconfigurations and protect against threats requires constant attention. However, with shrinking budgets and growing responsibilities, time and resources are at constrained. Therefore, sifting through pages of raw vulnerability information yields few results and makes it impossible to accurately measure your security posture. 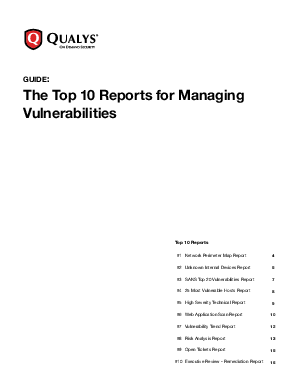 This paper cuts through the data overload generated by some vulnerability detection solutions and introduces The Top 10 Reports for Managing Vulnerabilities. This free guide covers the key aspects of the vulnerability management lifecycle and shows you what reports today's best-in-class organizations are using to reduce risks on their network infrastructure.